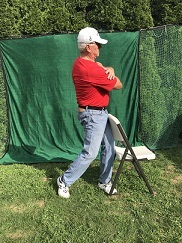 The Chair Drill teaches the student the feel for the correct sequencing of the weight pressure and lateral hip slide to initiate the downswing sequence. Your primary spinal tilt is the amount of forward bend (flexion) from the waist at address as seen from the "down the line" view. Secondary tilt (side tilt) refers to the side to side tilt as observed from the "caddie view", which is face on. During the backswing there is side tilt as your spine straightens, but from the caddie view it's not apparent - left image. 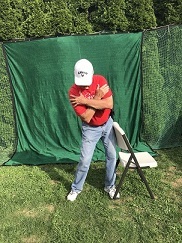 There will be noticeable side tilt from the caddie view when you slide your hips and hold your head stationary to initiate your downswing sequence - center image, as you move the back legs of the chair off the ground. For flexible golfers there will be a reverse "C" position at the finish with a bit of side tilt as the spine extends - right image. (All I can get to is a straight back). Get into golf posture with your arms folded across your chest and your hands on your shoulders. You can also do this drill with a club in your hands, and you can even hit balls as long as the chair back is short enough. 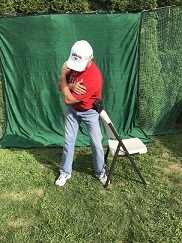 For indoor practice, just use the folded arms version. I prefer to see the weight feathered a bit forward - 52% on your forward (target side) leg, 48% on your rear leg, or 50% - 50% if you prefer a centered pivot over a forward sided pivot. Position a folding chair - like a card table chair, or a banquet chair, so that the chair is facing the target and that the upper center of the back of the chair is lightly touching your left hip. The chair does not lift up off its rear legs - your hip should maintain light contact with the chair and brush the chair lightly as you turn back. Your head should not move laterally at all. Rotation is OK, lateral movement is not. 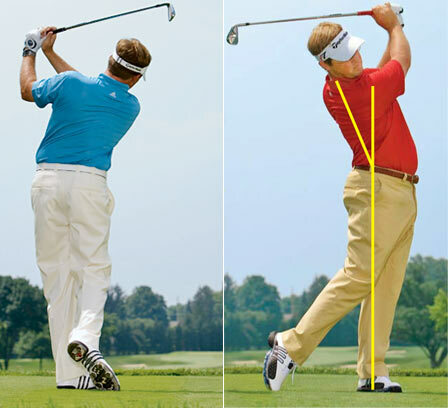 After your backswing is completed, the initial motion is to make a deliberate lateral shift of the hips towards the target WITHOUT opening your hips or shoulders, moving the chair off it's back legs. Deliberate doesn't mean massive. 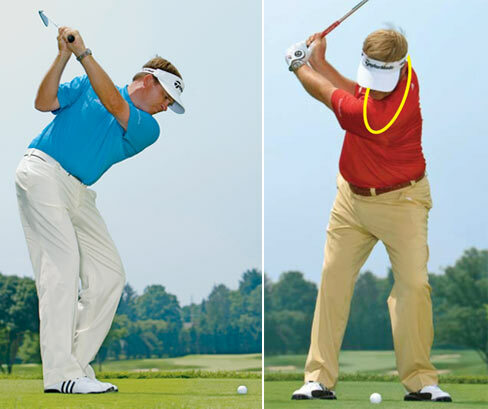 It's just a shift (or bump) to initiate the downswing sequence and to allow space for your arms to swing through without "getting stuck" behind you. The big mistake I see here is that the student thinks they should bump or slide their hips towards the target, but if they have turned back freely, their hips are pointing right of the target at the top of their backswing. If the student has the thought to slide or bump towards the target, their hips (and shoulders) tend to open as they execute their lateral slide, which causes a power leak as well as an incorrect angle of attack. The correct motion sequence is bump or slide first in the direction of the target without opening the hips or shoulders, and rotate second. Do not allow your hips or shoulders to open until after your lateral slide/bump is initiated. Have you noticed that I've emphasized don't let your hips or shoulders open as you initiate your bump or slide several times? After the bump or slide is completed, let your swing unfold as you rotate dynamically through impact into your follow through. 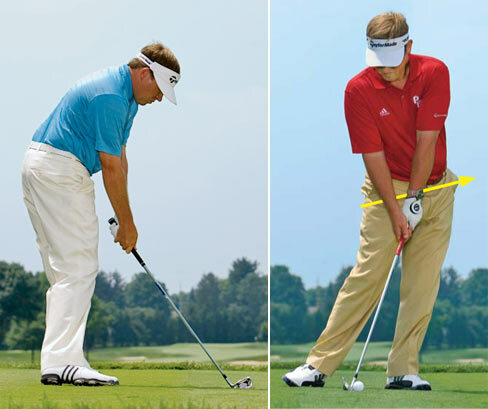 Straighten your left leg through impact and into your follow through as you rotate, and generate a slight hip thrust forward into your follow through. If you are flexible enough, you should have a "Reverse C" finish, if you are not very flexible, your finish will be tall. Either way, no upper torso weight should be bending or leaning towards the target at the finish. Each move should be very deliberate when you practice. They will blend together seamlessly when you actually swing after you have practiced them deliberately for enough repetitions. Make sure that your head does not slide laterally forward with your hips. It may feel like it staying back. It takes less than ten minutes to do 100 continuous repetitions of this daily, make the time do it and watch your downswing technique, tempo, and rhythm improve dramatically.